What does hosting a screening entail? It’s a big job! However, it may be easier than you’d imagine if you recruit a team to help. This is actually how we promoted the film when we did the event screenings in March, 2012. We had “street teams” on the ground that would distribute flyers and hang posters at relevant shops and events, especially those dealing with Japanese-Americans and/or Japanese pop culture fans. You can do the very same thing! Use your imagination! We had a lot of fun with this. The day of the event is crucial, and you should have your team handling things like collecting money at the door, either as donations to a Tohoku charity (we can recommend some) and/or for admission. If this is a small “community gathering” kind of screening, you will likely need someone helping with refreshments. It’s also a great idea to have a discussion before or after the screening to encourage sharing impressions and emotions. Where can I set up a screening? If you want to show the film at an actual movie theatre, our partners at Tugg.Com would be more than happy to set you up. 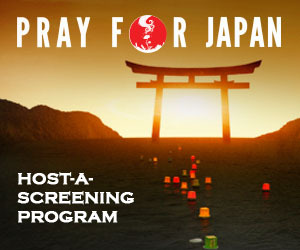 Visit the site at www.tugg.com/titles/pray-for-japan and they will have all the information on how to use their system to request a theatrical screening. If not at a movie theatre, you might want to consider any associations you have with schools, faith-based groups, community centers or your city elected representatives. Often times your local city government representative puts on movie showings in public parks and gymnasiums and places like that, especially during summer. If you own a business, set up a drive-in showing in your parking lot! Do you go to yoga classes or take martial arts? Maybe your teacher would like to have a showing in your studio! Libraries usually have conference rooms, and they are often equipped with A/V equipment! Pray For Japan isn’t rated by the MPAA. Is the content in this movie suitable for children? We include news footage of the earthquake and tsunami but we do not dwell on the actual events too long because our story is about how the people responded to the tragedy. You do not see people getting physically harmed and there is no offensive language. One of the stories deals with an older brother and how he reacted to losing his kid brother, along with his mom and grandparents, that could be somewhat disturbing. We believe that the film is appropriate for all ages (the director’s 7-year-old niece watched it without issue). Note, however, that the film is entirely subtitled in English so it does require reading throughout the film. How much do the license fees cost? The license and administration fee is $150 for small groups and $250 for larger institutions. These are for single-showing events. Included in that price is the media (DVD or Blu-Ray), shipping (within the United States), marketing support (postcard and poster template, as well as listing on our website and Facebook page). If you wish to use other media (DCP, HD-CAM etc.) or are outside of the United States, please contact us for a quote. Why do you charge for this? While our film is a not-for-profit project, producing and distributing the film is not free. Of course, the DVD or Blu-Ray itself costs money, along with the shipping, and the personnel to administer the program. If the film ever becomes profitable (unfortunately most documentary films do not), we donate all our profits to local charities in Tohoku that we work with. If I decide to host a screening, what decisions do I have to make? Is your screening PAID or FREE? At this point of time, we support both screening types. What is your choice of media? We offer DVD and Blu-Ray included in our price, but we recommend Blu-Ray because the cost is low and the quality is high. Will you have any activities besides the film? We can advise you regarding an introduction to the film, a Q&A session after the screening, a musical performance like taiko drums, etc. If you have something in mind, please let us know in advance since we will need to approve of the activity and so we can post it on our website to help promote your screening. Will you be accepting donations for any charities at the event? This is important information for us to know since we have commitments to certain charitable organizations. We will need to approve of the specifics. Do you want to sponsor a visit? If you would like to have the director, taiko group, or a representative from our production team join the screening, please let us know and we can discuss the details. What does Pray For Japan provide? What is my responsibility to provide? How do I send this paperwork back to you? If you have a scanner or a multifunction printer at your home or place of business, it’s easy. Scan the pages, and save each one as picture files. Then attach these files to an email back to us just like you’d send a photo. If you don’t have a scanner, no problem, just use your digital camera or even the camera in your phone and take pictures of the whole piece of paper. Just send these to us like you are sending a picture with your email.